Source: Toronto Sun, June 3, 1981. A version of this article was originally published July 3, 2012 by The Grid online (TheGridTO.com). It has been re-published to mark the departure of Captain John’s this morning, as the Jadran leaves her home in the harbour for a salvage yard. The 270 diners on the MS Normac—a.k.a. 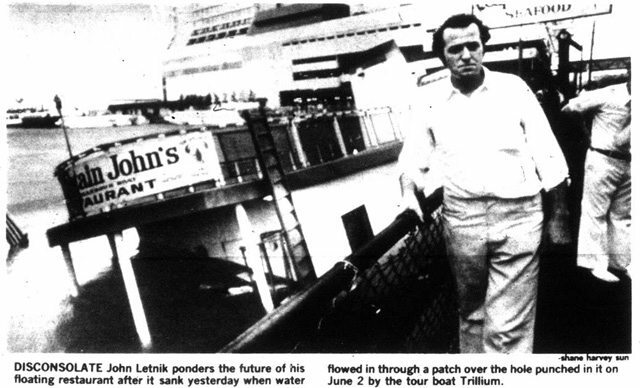 Captain John’s seafood restaurant—the evening of June 2, 1981 were enjoying a night out aboard the former Detroit fire boat and Lake Huron passenger ferry that had served as John Letnik’s flagship waterfront eatery for over a decade. But, around 9 p.m., some patrons sensed they were in a disaster movie as a larger vessel approached the boat with no signs of stopping. Just as panic started to spread, the steam-powered, paddle-wheeled ferry Trillium rammed into the restaurant. Source: Toronto Star, June 3, 1981. 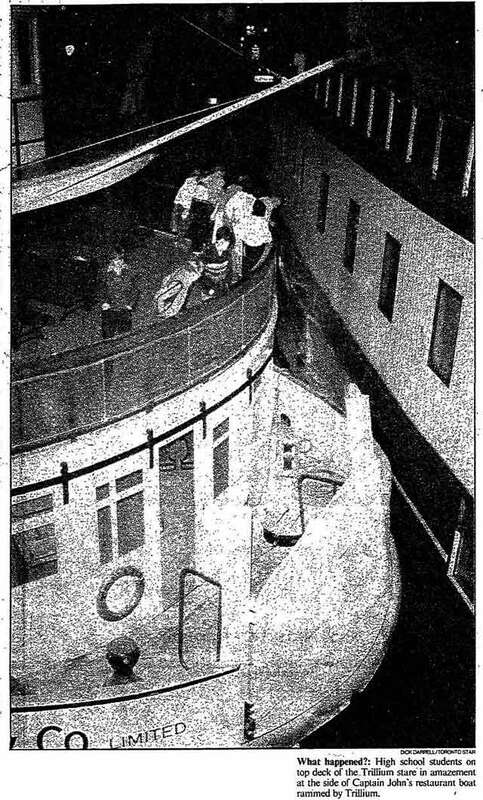 The Metro Toronto–operated Trillium, restored five years earlier and used primarily for chartered cruises, was carrying the school band from Scarborough’s David and Mary Thomson Collegiate Institute back from Ontario Place when the crash happened. While the Trillium experienced superficial damage, a small hole opened up on the Normac. Water flowed into the lower deck and, by the time firefighters plugged the hole, three feet of liquid had rushed in. Pumps were placed aboard the Normac until a temporary patch was installed, while waiters took food and utensils to Captain John’s larger banquet ship, the Jadran. Only three people were treated for injuries. The following day, a Ministry of Transport engineer concluded a hydraulic lock prevented the Trilllum from reversing when it approached the slip it shared with Captain John’s. It was announced that the Trillium would use a different slip upon returning to service. Meanwhile, Letnik envisioned losses of up to $1 million if the Normac had to endure extensive repairs, as the accident happened at the start of his busy season. He felt lucky that the Trillium’s bow wasn’t sharp enough to cut the Normac in half, and believed that if pumping hadn’t started immediately, the ship would have sunk. Source: Toronto Sun, June 17, 1981. Unfortunately for Letnik, that is what happened two weeks later. Around 5:30 p.m. on June 16, 1981, Letnik noticed water pour through the patch. He called in a ship-repair company, harbour police, and firefighters, but the boat tipped and, as the Star put it, gave “a mighty groan and slumped to the bottom of the harbour.” A teary-eyed Letnik repeatedly muttered “that’s my life.” Ironically, during earlier tussles to determine which level of government had jurisdiction over a floating restaurant, city officials suggested the Normac should be sunk so that it sat on city land. Source: Toronto Star, June 17, 1981. For the rest of the decade, lawyers grew rich as the parties involved battled over blame and compensation. Early on, Letnik threatened to seize the Trillium unless a $2.4 million bond was posted. Metro Toronto blamed the Toronto Harbour Commission for allowing the boats to share a slip. Despite shifting his business to the larger Jadran, Letnik claimed business declined to 10 per cent of its previous volume. 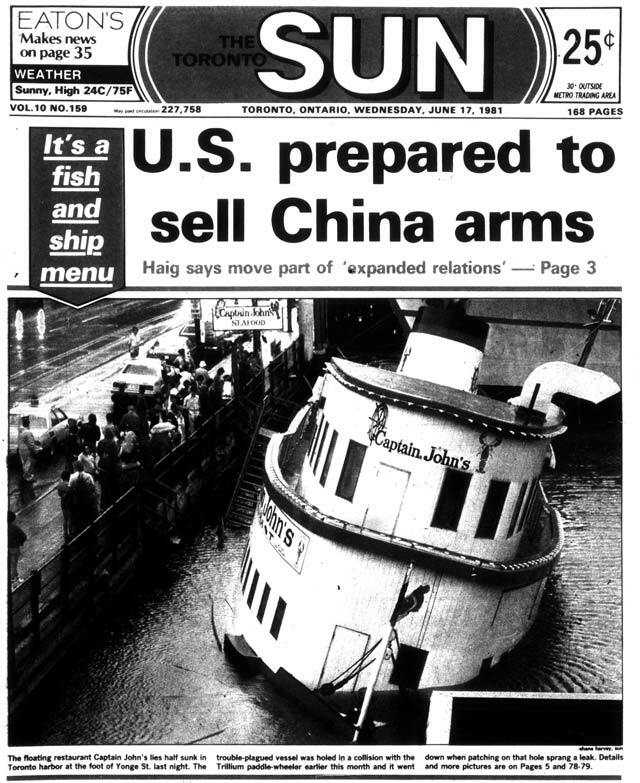 A federal court ruled in March 1985 that Metro Toronto was responsible only for the initial damage from the ramming and not the sinking, which was blamed on disintegrating hemp used to seal the hull. Further appeals ensued and, while Letnik received some compensation, he felt it was nowhere near enough. The Normac sat in the harbour for five years. While the top half was removed in 1983, the hull remained underwater until it was raised in June 1986. Even that didn’t go smoothly—an inspector from the City’s street-allowance department forced the operation to stop for nearly two weeks while a street occupation permit for the crane was secured. A 1,000-pound cast-iron propeller was returned to Letnik, who used it as an advertising tool. The Normac was rebuilt, shipped to Cleveland, and operated under the Captain John’s banner there during the early 1990s. 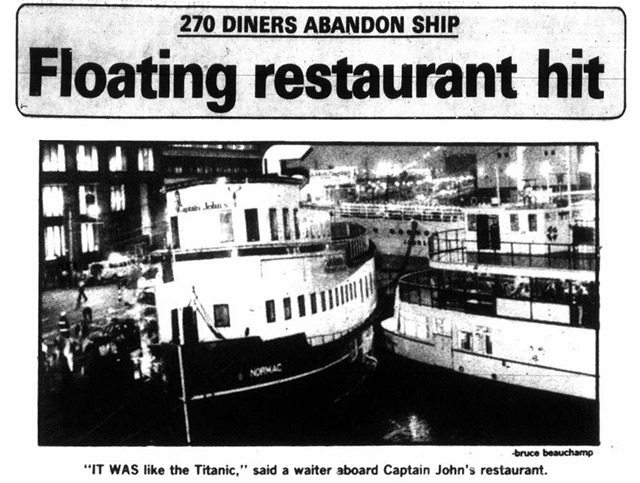 The boat moved to Port Dalhousie around 1995 and operated as the Riverboat and Toyko Joe’s restaurants. Disaster struck again when a suspicious fire gutted the ship shortly after Christmas 2011. Perhaps, at some point in its distant past, the Normac earned a sea curse that continues to affect it and its past owners. As for the Jadran, Letnik continued to operate it as a restaurant until the City closed it in June 2012 after its lease was rescinded by Waterfront Toronto. For the past three years, it has rotted away amidst failed attempts to sell it, court auctions, and efforts to recover more than $1 million Letnik owes in back taxes and fees. Don’t count on today’s tow out of the harbour, which will deliver the Jadran to Port Colborne for scrapping, to be the final chapter of the Captain John’s saga. Additional material from the June 3, 1981, June 4, 1981, June 17, 1981, January 2, 1984, March 30, 1985, April 4, 1986, and August 14, 1995 editions of the Toronto Star, and the June 3, 1981 and June 17, 1981 editions of the Toronto Sun.